Can you tell we have been feeling a little crafty around here lately? The girls and I have been working on so many projects that I hardly know where to start, but I figured I better get going on sharing some of our gift ideas so that y’all can get started on them too! 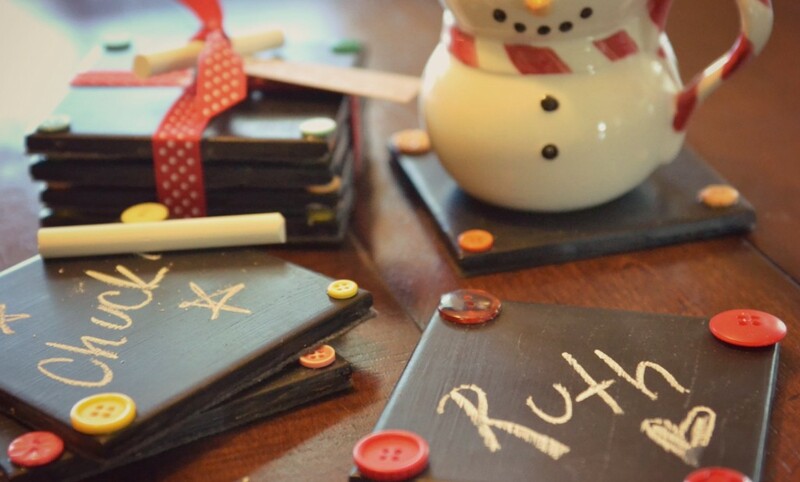 These fun chalkboard coasters might be one of my most favorite projects ever–I just love how cute they turned out! We have already started making more so that we can keep a set for ourselves. 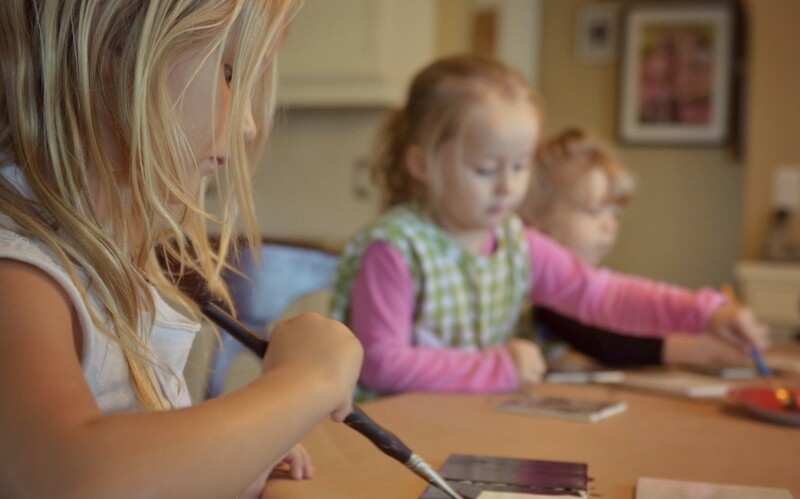 They are a great project for the kids to help with because they are so easy, but they are one of those projects that require a few minutes at a time, followed by lots of drying time. Be sure to give yourself at least 3 or 4 days to get them done! I used some Martha Stewart chalkboard paint that I already had on hand from when I did this rotating artwork display gallery wall. It works on all surfaces so it is a good choice. A small bottle goes a LONG way! The buttons I used were leftover from the cute as a button baby shower I threw for my goddaughter in May. JoAnn’s has a 1 pound bulk pack of assorted buttons for around $6–use a coupon to get it for half off! For this project you could also skip the buttons or just buy a small pack of the color you wanted to use. 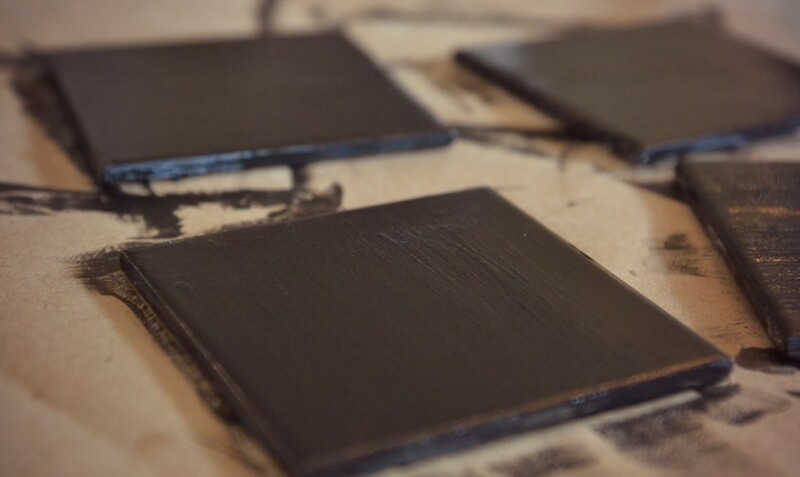 Start by painting the front and sides of tiles with a thin layer of chalkboard paint. I let the girls paint them, then I smoothed out the paint and touched up any spots they had missed. Don’t worry if it doesn’t cover on the first coat. You will need at least 3 coats of paint. Let dry at least 3 hours or so between coats. After your final coat of paint, let tiles dry completely so that paint can cure–at least 24 hours. 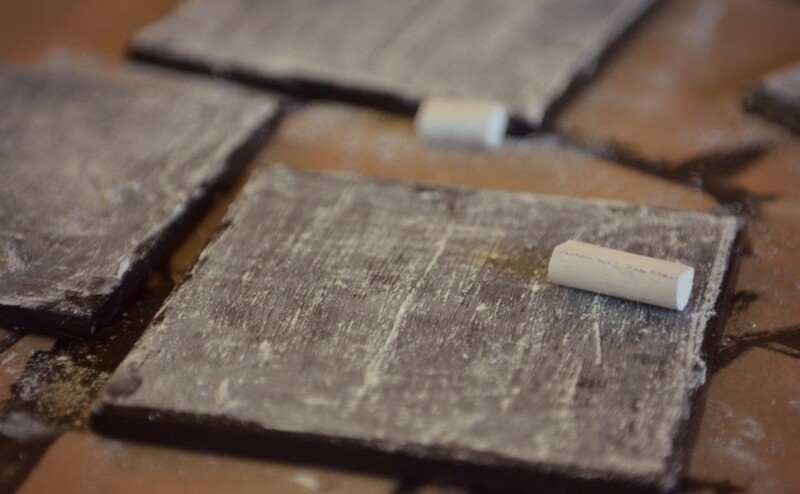 Next you will need to season your little chalkboards by using the long side of a piece of chalk to cover them completely. 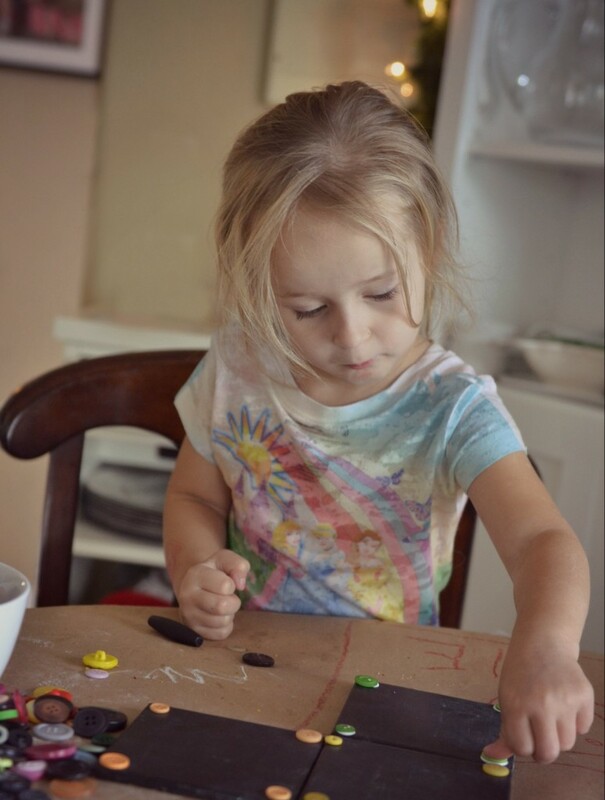 Wipe the chalkboards clean with a dry paper towel; if they seem too dusty you can wet it just a little. Select your buttons. 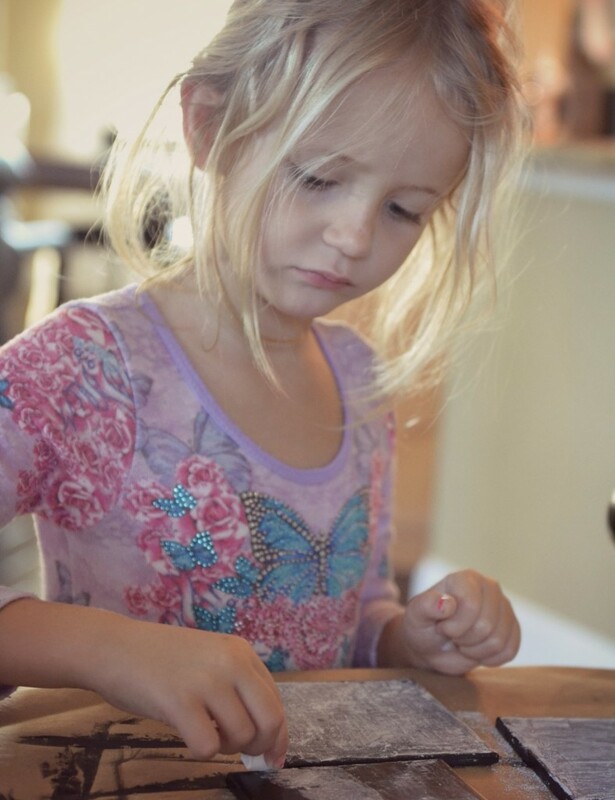 The girls had a blast with this step–mommy’s buttons are usually off limits. We decided to put one button on each corner, and to do each tile with just one color. I instructed them to look for flat buttons that were small-to-medium in size. 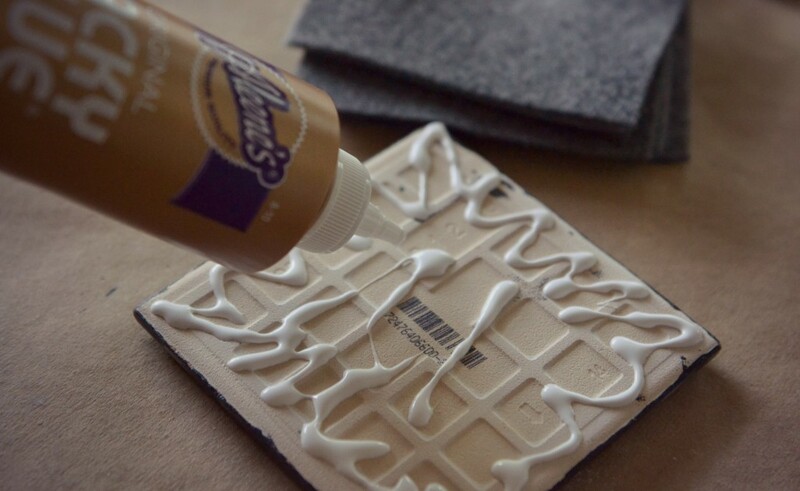 Lay out the buttons how you want them to look on the tiles, then glue in place. We used tacky glue so that the girls could do it themselves, but hot glue would probably work too and dries a LOT faster. The tacky glue takes forever to dry! 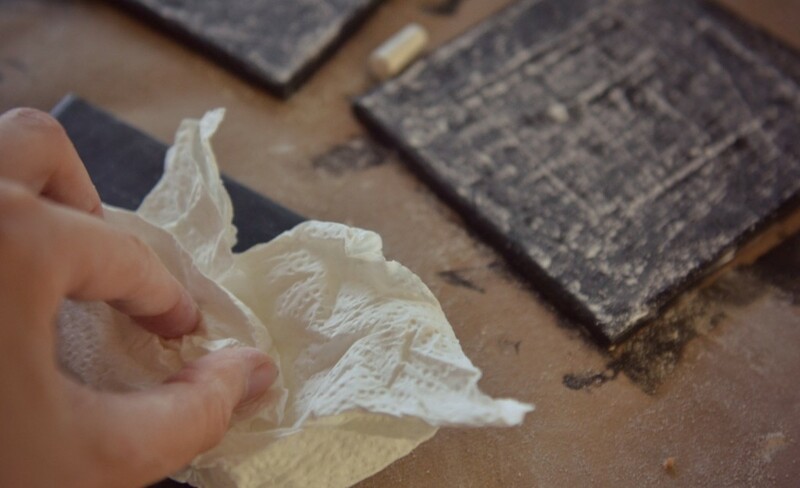 Using a tile as a size guide, cut out squares of felt then glue to the backs of the tile. 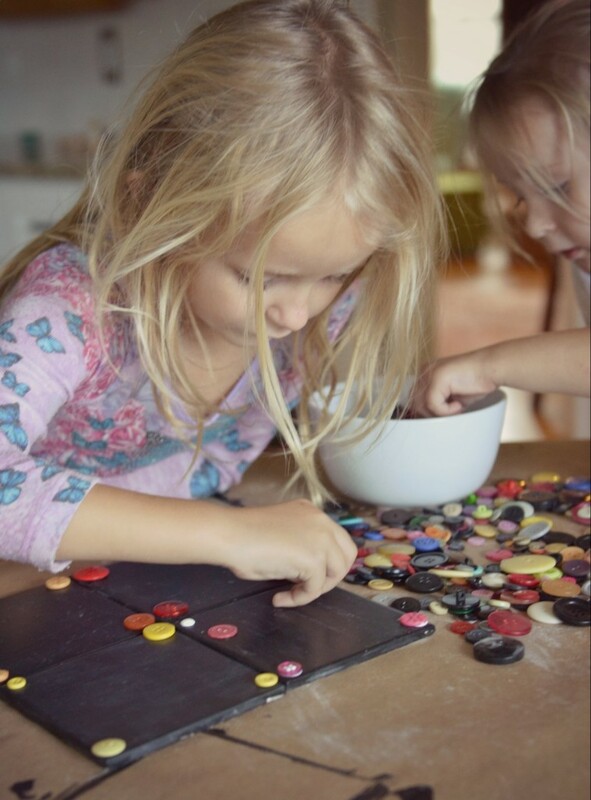 Let dry completely–be sure to keep the chalkboard side down and the felt side up while they are drying or it will take a lot longer. You know they are dry when no condensation forms on the tiles when you stack them. 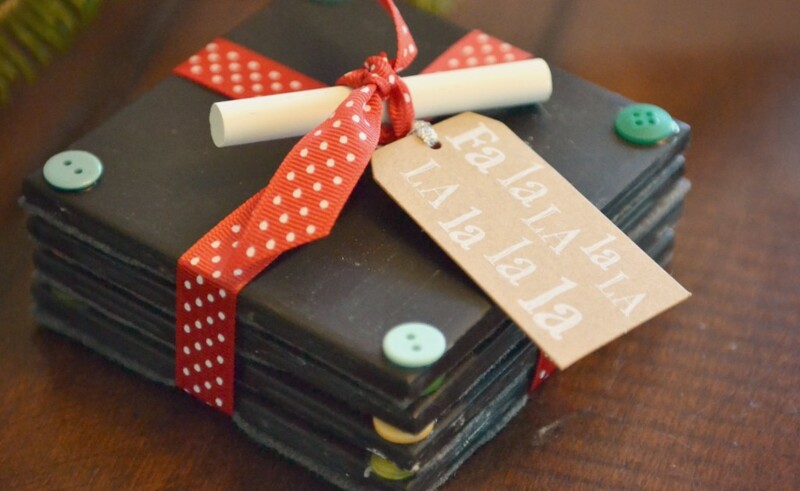 Once the coasters are completely dry, stack 4 together then tie with a pretty ribbon, gift tag, and piece of chalk. You’ve now got the perfect gift for just about anyone. But be sure to make extras…..you’ll probably want to keep a set for yourself! Love love LOVE! I can’t wait to make some! These are really cute. I don’t know where you find the time to do all these crafts but I am loving all the ideas! These are adorable! I happened to make some last week (sans buttons). My husband put his cold drink on it and the sweat lifted the chalkboard paint off the tile. I was wondering if you’ve had this problem and if not what you may have done differently. Thanks! I have not had this problem with the ones I made for ourselves–I’ve used them several times with iced drinks with no issues. 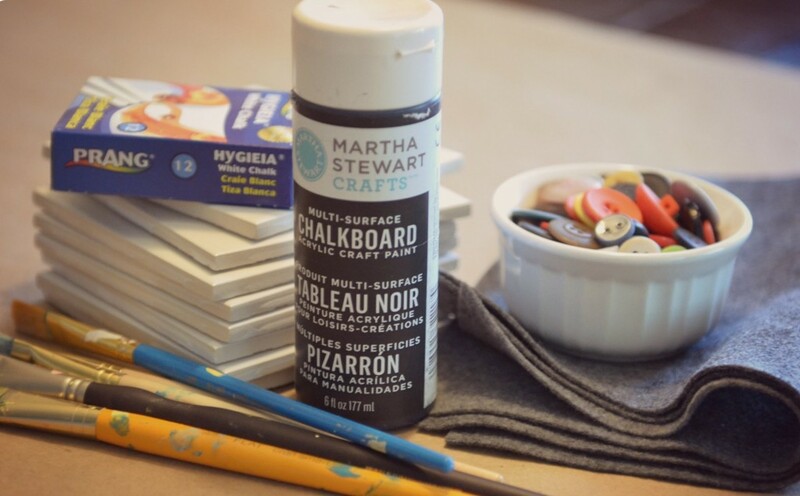 Did you use this particular paint–the Martha Stewart brand? It says it is for all surfaces, including glass and ceramic. Also, allowing sufficient time for the paint to “cure” and then seasoning it is really important too! 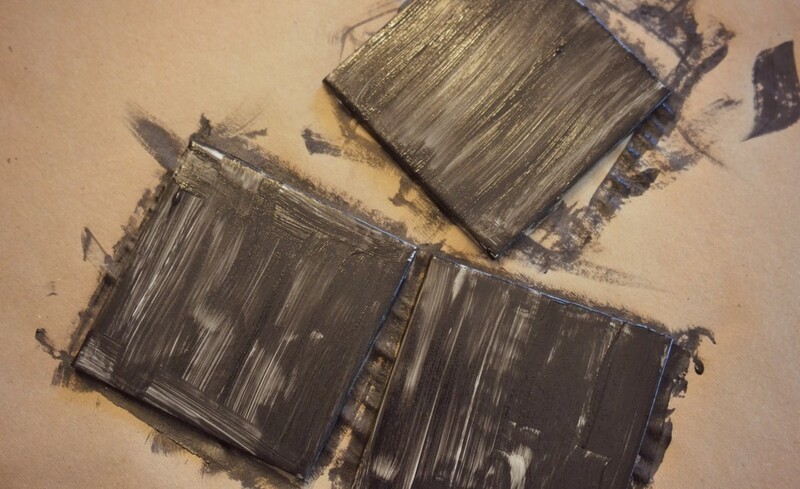 Was trying to make these and am having a hard time finding unglazed 4×4 tiles…did you use unglazed or glazed? Any problems so far? 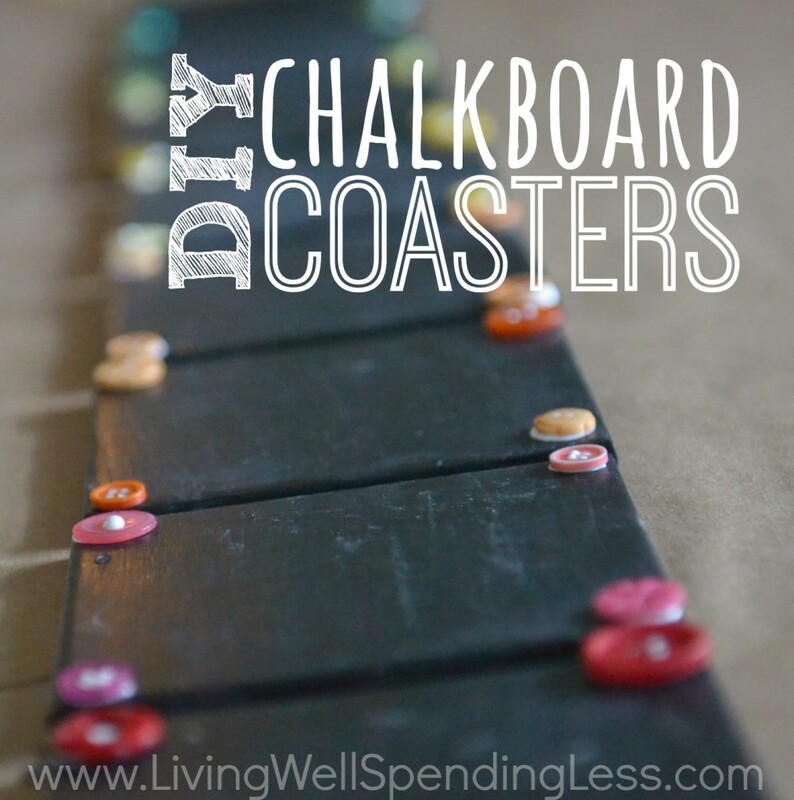 I’m crushing on chalkboard paint right now and these are fanastic. I made chalkboard trivets a while back and found with the liquid chalk pen and as you said, letting it all dry and cure, they handle moisture really well. Love using what you have. Made these with my kids over thanksgiving…they really had fun with it and it turned out great! Thanks for the idea. For the felt on the back could you use fleece instead? I really love this idea and I have a bunch of fleece from another project and wasn’t sure if it would work the same or if the felt is a better choice. Did you use/do anything to prep the glazed tiles? Did you sand or use a primer? is an extremely well written article. I’ll be sure to bookmark it and return to read extra of your useful info. Absolutely ingenious!! Just the fact that the children can do this is awesome and meaningful! thank you for sharing! These are so cute! I am going to make these for some family members for Christma, but I can’t find any tiles. Where did you get the tiles from? I have checked online at Hobby Lobby and Michaels and nothing was coming up in my search. Any ideas you have would be appreciated. Thanks! I come across cheap tiles all the time at yard sales! Going to grab them to make birthday gifts for my friends this year! Thanks! I was hoping to make these coasters for my mom when I found out that I had tiles from years before but the front side of them have a shiny material and I can’t use the backside because they have stickers that would leave a mark if I peel them off. So, I was wondering, would the shininess affect the chalkboard paint? For example, not sticking to the tile. Thank you! 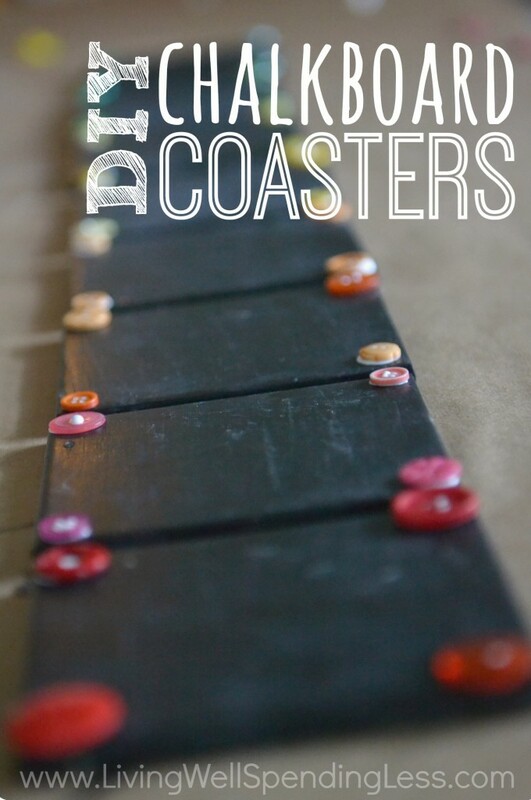 Those coasters are such a simple but modern idea; my mom is all about having cute, simple decor in the house and I am considering making her a set of these for Christmas this year. You say you found the tiles at Home Depot, but how much were they? I only ask because I am on the tightest budget you can imagine, so I’d really appreciate if you would give me an answer! But can you use pieces of wood squares instead of the ceramic? Yes, you could use wood squares but you might need to put more coats of paint to the squares. I would suggest you try a test piece of wood before you start your project.